Hi everyone! Remember in my post *here,* I got some (well, not some, but A LOT) of products from the HBC's skin care line, Body Recipe, during the Great at 88 promo. I've been curious about Body Recipe products since I started shopping at HBC but it's only now that I've gotten around to actually trying some of their products. 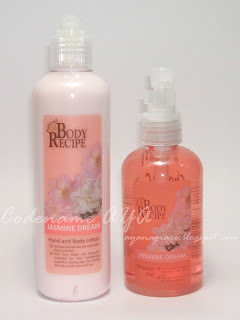 I was sent this pair of hand and body lotion and shower gel a few weeks ago and I got mine in the variant Jasmine Dream. These products are part of Body Recipe's latest body care collections. There are three collections, by the way, and each contains a body mist, a lotion and a shower gel. The three available variants are Jasmine Dream, Sweet Pea Fantasy, and Cucumber Bliss. I believe that the body mist has been available for years now but the lotion and the shower gel are new products. Description (from HBC): The Body Recipe shower gels and lotions contain naturally-derived moisturizers that nourish skin while the body mists are infused with relaxing scents to make each spritz an enjoyable experience. Cucumber tightens open pores and has a cooling effect to gently soothe skin. Jasmine’s skin healing properties are perfect for dry, sensitive skin while sweet pea locks in moisture leaving skin soft and smooth. 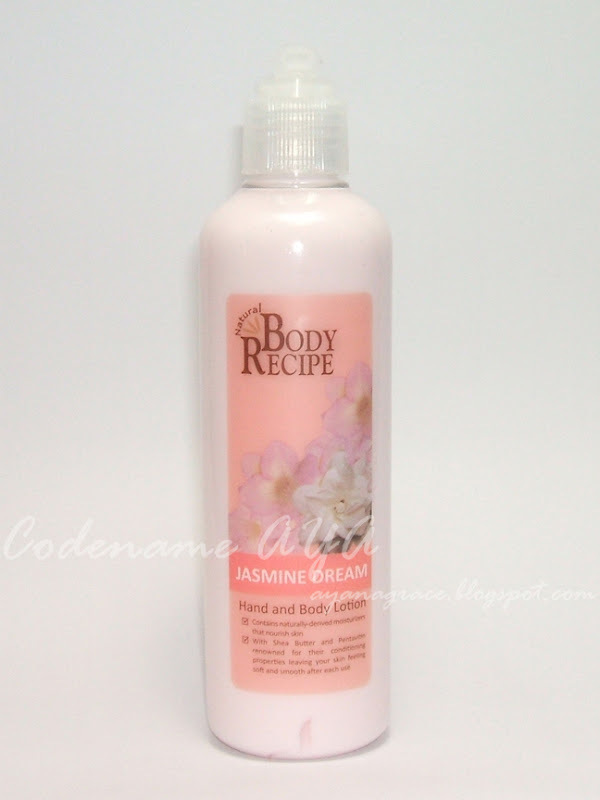 Description: The Body Recipe Jasmine Dream Hand and Body Lotion contains naturally-derived moisturizers that nourish the skin. Contains Shea Butter and Pentavitin renowned for their conditioning properties, leaving your skin feeling soft and smooth after each use. As for the scent... honestly, I don't know what the actual jasmine flower smells like but for me this lotion smells really nice. The smell is not strong and overpowering. It's just a subtle smell which I like. Doesn't give me a headache unlike other strong fragrances. As for the consistency... I compared this to my Vaseline lotion and this one has a bit thicker consistency. It's still easy to apply and spread onto the skin, though. It gets absorbed by the skin quickly and doesn't leave a sticky or greasy residue. Description: The Body Recipe Jasmine Dream Shower Gel contains naturally-derived moisturizers that nourish the skin. Contains skin conditioner for soft and smooth skin. 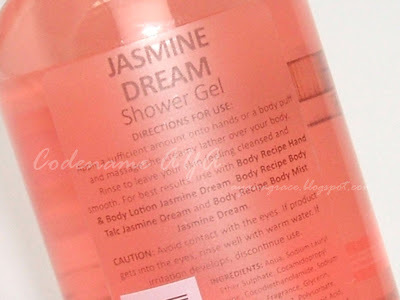 This shower gel comes in a pump bottle that contains 200 ml of product and retails for 186 PhP. Again, I personally prefer this type of packaging than the squeeze-type bottles because pump bottles are more hassle-free to use when I'm in the shower. Ingredients: Aqua, sodium lauryl ether sulphate, cocamidopropyl betaine, cocodiethanolamide, sodium chloride, fragrance, glycerin, polyquaternium 7, polysorbate, trimethylglycine, EDTA, citric acid, chlorphenesin, methylisothiazolinone, CI 17200. Same nice subtle scent with this one. The consistency is just right for me - it's not too runny but not too "jelly" either. Tip: If you just use your hands, it wouldn't lather up as much. I suggest you use a bath puff or a wet cloth or something. I want to try the body lotion! I think it's really cheap and I like that it's non-greasy. I'm not really into florally type of scent, but I wonder how the cucumber smells like. I might check that out when I stop by HBC and see if I like it. :D Oh, I also like pump packaging. I think it makes life easier. lol. This is true. There lotion is almost the same as vaseline and jergens. Thick and warm. Yup. last week, my cousin is using it right now, she has the green one, i think cucumber? love your new header!! cool!